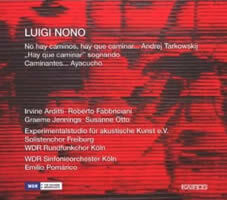 Luigi NONO: No hay caminos, hay que caminar… Andrej Tarkowskij (1987); “Hay que caminar” sognando (1989)*; Caminantes… Ayacucho (1986-87)**. Irvine Arditti*, Graeme Jennings* (vlns), Roberto Fabbriciani** (fl), Susanne Otto** (m-sop), Experimentalstudio für akustische Kunst e.V. **, Solistenchor Freiburg**, WDR Rundfunkchor Köln**, WDR Sinfonieorchester Köln, Emilio Pomárico (cond.). Kairos 0012512KAI (2 CDs) (http://www.kairos-music.com/). Distributed in the US by Allegro Music (http://www.allegro-music.com/). Perhaps too eagerly I mentioned that there would be a second part in this string of Nono explorations. As much as Nono stands tall in my regard, I admit that I boxed the first disc in this Kairos set and overnighted it to the dead letter office. I was delighted that Nono’s Caminantes trio has been assembled. Recall that Nono saw a potent inscription on a Toledo monastery wall in 1985: “Caminantes, no hay caminos, hay que caminar.” (“Travelers, there are no roads, but we must go on.”) One of Nono’s favorite poets, Antonio Machado, also penned similar lines. This expression of wandering across new ground held great appeal for the composer. The orchestral No hay caminos, hay que caminar… Andrej Tarkowskij ranks among the 20th century’s most distinctive utterances. An orchestra cordoned into seven choirs (à la Gabrieli) positioned around an audience alternates silence, microtonal murmurings and penetrating attacks. After the thrilling opening fusillade, the microtonal sounds did not enchant. While Nono’s late works are meant to operate at the threshold of listening, they should not be so self-effacing. A replay suggests the ensemble’s arid brittleness as raw pain, an attribute this listener had not considered. The turbulent outbursts and quiet rattling could easily be death throes. Only one pitch appears: The note G in all possible octaves embellished with sharps and flats and a variety of precisely indicated microtones. Perhaps Nono was inspired by his Roman neighbor, Scelsi, to create his own one-note piece. The notes offer conductor Michael Gielen’s theory that the G, or sol, represents the sun. Of course Nono was known familiarly as Gigi, so the work could just as easily be autobiographical. The dedication encircles Tarkovsky, the famed Russian director whose precise pacing wins admirers and detractors. Tarkovsky’s cinematic visions were hard won, and despite today’s acclaim, accurate prints reflecting his wishes are hard to come by. No doubt Nono felt a kinship. The immediate reference is Nostalghia among whose themes include searching for something that cannot be found. Contrasting Pomárico’s Tarkowskij (24:21) with others, Claudio Abbado’s October 1991 presto reading (16:51) with the Ensemble Anton Webern in a “Wien Modern II” collection with Kurtág, Furrer and Rihm (DG 437 840-2) startles with its sprightliness. Nono specified an ungainly slow quarter-note equaling 30 beats per minute. Each 4/4 measure spans eight seconds. The pulse stagnates. The massed basses and forceful mistuned unisons terrify on Mario Venzago’s September 2000 recording (25:45) with the Sinfonieorchester Basel (col legno WWE 1CD 31822 with Variazioni canoniche, Varianti and Incontri). My favorite recording remains Gielen’s (24:00) on Astrée E 8741 (with Variazioni canoniche and A Carlo Scarpa) from September 1989, the “Création européene” a bit rough around the edges albeit present and tactile with its nervously bouncing trumpets and clenched outbursts. I am perplexed by the Pomárico version’s frigidity. Despite profound admiration for the related La lontananza nostalgica utopica futura, I admit an inexplicable coolness towards the violin duo “Hay que caminar” sognando (26:37) which must be the least violinistic violin duo ever. At its heart lies Verdi’s “enigmatic scale” expressed with stratospheric tones, repeated chords and, perhaps inconceivably, silence. It’s exceptionally coarse here, which is perfectly suitable, although the scraping and grinding might discourage a newcomer. The booklet implies that sognando’s three movements are separately tracked, where in fact they are lumped together. I didn’t detect the change in dimension as the performers migrate among music stands between movements. Arditti’s previous stroll involved David Alberman on Montaigne WM 334.789005 (27:40: 6:06; 10:34; 10:34, and joining with the rest of the quartet for Fragmente – Stille). Arditti and Alberman delivered the premiere. The July 1990 recording adds resonance to the febrile outbursts and distinct sonic placement. Fourteen years later Graeme Jennings makes for Arditti’s near twin. What once may have been exciting seems frail and grating now. Am I alone in noticing that the Arditti Quartet’s recent efforts leave a metallic aftertaste? For decades Irvine Arditti has piloted the string quartet into uncharted waters. Could it be the current foursome predisposes its leader towards a steely sound? Is it harder to summon that adventurous spirit? Let’s suppose familiarity influenced my reaction to the first disc. Caminantes… Ayacucho (34:33) was completely unknown to me and I was in awe. It is similar to Tarkowskij but with what initially seemed new and breathtaking constellations. On subsequent plays I grew confounded. The harp and high bells, the breathy flute and the chorus create an otherworldliness we might associate with Kancheli or Tavener, not Nono. I was also put in mind of Scelsi’s Uaxuctum. In 1824, the Battle of Ayacucho gained Peruvian independence from Spain. 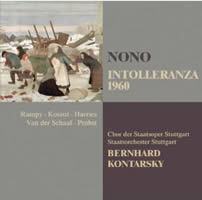 Ever political, Nono’s incorporation of texts by Giordano Bruno, one of the Inquisition’s victims, marks this composition as a cry against colonialism and intolerance. The work bears Nono’s hallmark, but even with the participation of the composer’s colleagues Roberto Fabbriciani and André Richard something seems awry. Nono fanatics will welcome this to their shelves unhesitatingly — there’s no other recording of Ayacucho easily obtainable. (Musicom MC 9602 and MC 0007 offer Abbado’s direction. Both are hard to find.) I can offer no better than a reluctant recommendation. Perhaps I expect too much. Luigi NONO: Intolleranza 1960 (1960-61). Cast includes David Rampy, Urszula Koszut, Kathryn Harries, Jerrold van der Schaf, Wolfgang Probst, Joseph Dicken, Christian Hoening, Carsten Otto, Hermann Wenning. Chor der Staatsoper Stuttgart, Staatsorchester Stuttgart, Bernhard Kontarsky (cond.). Warner Classics and Jazz 2564 68021-6 (http://www.warnerclassicsandjazz.com/). Distributed in the US by Naxos (http://www.naxos.com/). Perhaps the folks at Warner dusted off this agitprop as a lark. Even for Nono, Intolleranza 1960 makes for a heavy-handed political hour (Act II, Scene I contains no music and isn’t recorded). A migrant (Rampy) looks for work and stumbles upon a protest only to be arrested and tortured. After escaping a concentration camp, he encounters a barrage of empty slogans and sensational headlines, “some absurdities of contemporary life,” and more scenes of injustice and fanaticism. Arriving at the river which marks his country’s border, he realizes there is suffering everywhere. The river crests and he drowns. For this American listener, it helps that most of the texts are in German and can be ignored. (The original 1961 La Fenice premiere under Maderna was in Italian.) Without score or visuals, it’s an upstream struggle, despite the strong soloists, the well-shaped chorus and the profusion of gritty dissonance precisely delivered by the Stuttgart team. What made this original 1993 Teldec release more digestible were several necessary essays (by Nono, Klaus Zehelein and Jürg Stenzel) which identify Intolleranza as a culmination of Nono’s aims and technique. Nono had been growing apart from his Darmstadt brothers Boulez and Stockhausen, refuting chance in music and bemoaning his peers’ taste for academic complexity. However, on the surface, this “azione scenica in due tempi” rumbles and grumbles like any other mid-century angry serialist essay. Parts of Il canto sospeso and Incontri are folded into the texture. Only Nono could have fueled a chorus with such tightly spaced chords, leaps and jumps. Dallapiccola’s Il prigioniero (1944-48) might be a precedent. A distant cousin deserving a nod is Nono’s father-in-law’s incomplete Moses und Aron (Intolleranza is in fact dedicated to Schoenberg). It seems strange that Nono would have cozied up to opera, although others, most famously Verdi, have used the genre to promote political ideas. Nono’s avoidance of standard formats suggests a preference for non-traditional approaches. “Scenic action,” his designation for dramatic works, is how he labeled Al gran sole carico d’amore (1972-74) and Prometeo (1984-85). Without going into Warner’s intentions or corporate sense of humor, we should be grateful that this recording has resurfaced. Kontarsky’s Stuttgart production came just a few years after the label took on Zimmermann’s Die Soldaten. At the start of 2011, 50 years after hosting the premiere, La Fenice offered several performances, suggesting that Nono did achieve enough of a balance between topicality and universality to warrant a fresh look. In conjunction with the Fondazione Archivio Luigi Nono, the Fondazione Emilio e Annabianca Vedova hosted the exhibition “Intolleranza 1960: A cinquant’anni dalla prima assoluta” in 2011.